Prime Minister Narendra Modi has embarked on a week-long international tour, and this time, it isn’t being dubbed just as another business tour, but the one for a strong pitch for a seat in UNSC (United Nations Security Council). With an assertive China in the east and belligerent Pakistan in the west. Modi wants to garner support for India’s UNSC bid to deal with the Sino-Pak threat. Interestingly, the flashpoint of this visit is a power summit of the G4 Members: India, Japan, Brazil, and Germany. Purposed by Modi, and endorsed by Shinzo Abe, the Japanese Prime Minister, the G4 collectively wants to use its powerful clout to garner international acceptance for the UNSC reforms. Apart from reforms in the Security Council; Modi, who has failed to pass key laws like land acquisition and GST – owing to the lack of support in Rajya Sabha, India’s upper house; knows that only foreign investment can keep the India story growing. With falling exports and economic woes steadily picking up, it is only the investment that can save the day for him until he is able to amass a full majority of India’s both legislative houses. 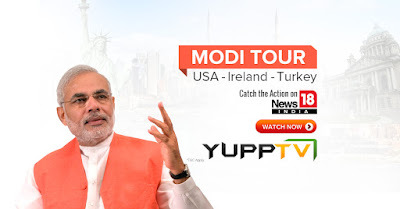 Surprising many political observers, Modi chose Ireland as a stopover instead of Germany. It is being dubbed that the Indian side wanted to avoid back to back Modi-Merkel meetings, however, the 26,000 strong diaspora was the prime reason of choosing Ireland over other European countries. In 2013, trade between the two was €2.48 billion, Modi wants this to go up and wants more investment from Ireland in his various pet projects like Skill India, Smart cities etc. In order to keep China in check and improve India’s investment profile, India needs the US on its side, hence before embarking the trip, the CCS cleared some key defense purchases like the $2.5 billion Chinook helicopter deal. This would be Modi’s second visit to the US, and the third meeting with Obama. Although white house calls this visit primarily focused on climate change and economy, everyone knows that it would revolve around the dragon which is flexing its muscles to settle economic and border-related disputes. Catch all the action in News 18 India live, for all the detailed information on international tour of Prime Minister Narendra Modi.